After breakfast with the Sugarmans, we drive along the coast to Mamallapuram (formerly called Mahaballipuram). This is a kind of open-air museum of Tamil art in rock, which is the work of students under the patronage of the Pallava rulers. 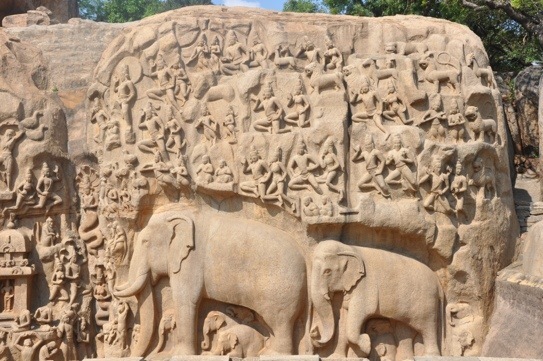 Strewn along the coast are some outstanding examples of 7th century sculpture – forms of temples (not used as temples, but which became the basis for the architecture of future temples), an enormous bas-relief depicting scenes from the Indian epic the Mahabharata, and an amphitheater of six chariot-shaped temples. Entering the first area, you are greeted by an enormous boulder, which appears to rest precariously on a slope, having apparently rolled down long ago from a higher perch. 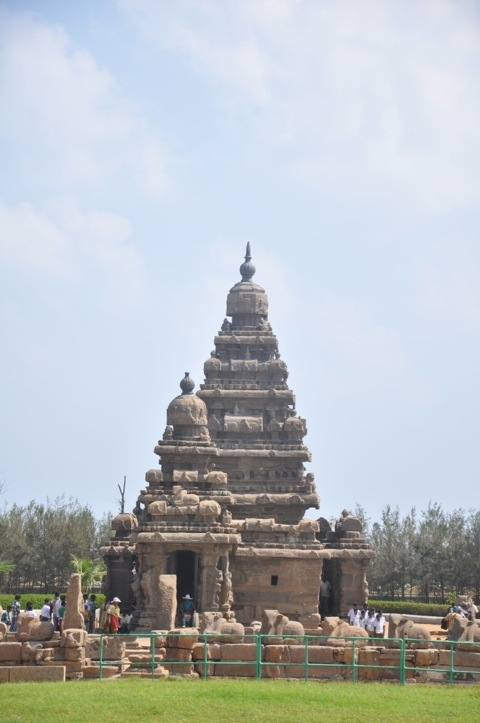 The landmark of this collection of works is the Shore Temple, located right on The Bay of Bengal, a world heritage monument, and the only surviving one from a complex of probably seven temples, the other’s having been claimed by the sea. We returned to the hotel, where we had several hours to lunch and relax, before being picked up and taken for a lecture/demonstration on the classical Bharatnatyam dance. 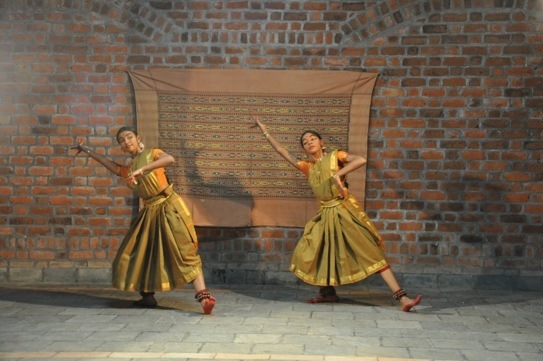 Bharat Natyam is one of the oldest dance forms in India and was nurtured in the temples and courts of Southern India. The art was handed down as a living tradition under the “Devadasi” system under which women were dedicated to temples to serve the deity as dancers and musicians. They also tended to serve the priests, as unwilling concubines. As we entered the parking lot of a complex that contained crafts and examples of the architecture of several areas in the South, there was a bus and many cars, which led us to think that, instead of a private demonstration, we were going to be part of a large group. Not so. We were treated to an hour and a quarter performance by girls from ages 9 to 19, who danced with great skill and enthusiasm. Our enjoyment of the program was enhanced significantly by Devika, a well-known former danseuse and an established expert on this particular dance form, who explained the dances and techniques to us. Back to the hotel for a quick shower, then an excellent dinner outdoors, enjoying cool breezes and tolerating rather loud music from a party near the restaurant. Only disappointment was that they were out of the appetizer I’d wanted, seared sea scallops with Wasabi-infused swordfish roe. Damn. What model of camera(s) are you using on this trip? Really terrific stuff, Arnie. Most readable and the pics capture what the words cannot. 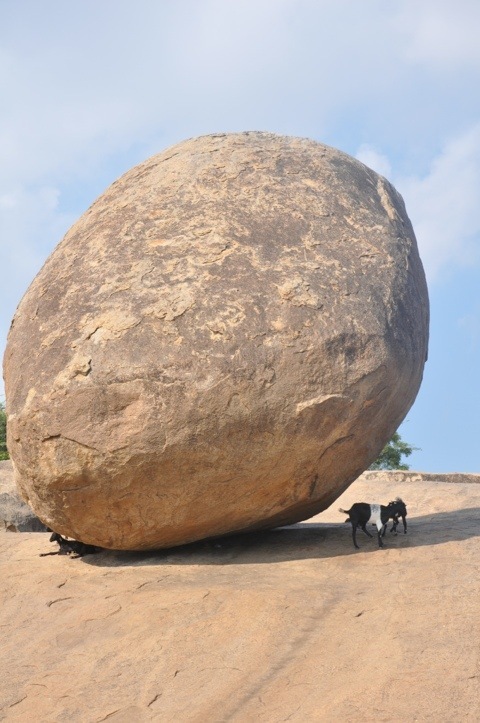 Loved the goat under the boulder. Clearly only shade for one. (Knowing your flexibility, curious as to what the substitute appetizer might have been.) Keep up the good work. Interesting notes about the architecture. I think I’ll pass this post on to a friend of ours who’s an architect. I think he’d find it really interesting. What did they do with the bus loads of folks while they entertained you? I can’t imagine! But then, a chief, his wife, and their companions should only expect as much. Wish I could’ve seen the dancing and heard the commentary.